During Question Period in Ottawa on Tuesday, the Conservatives accused the Liberals of using “scare tactics” to fight back against calls for a harmonized tax regime. 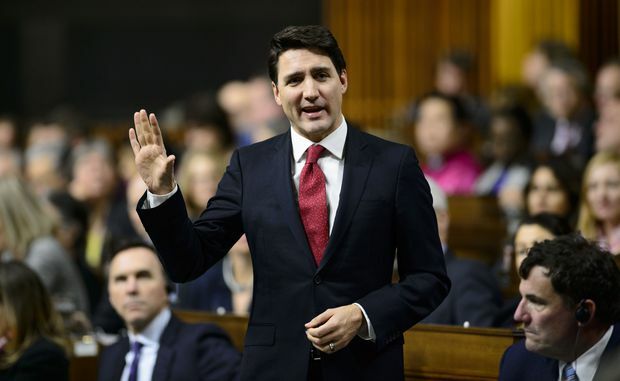 Prime Minister Justin Trudeau is accusing the Conservative Party of “pandering” to Quebec voters by supporting the transfer of income-tax collection duties in Quebec to the provincial government. The Conservatives are putting pressure on the federal government to abide by the wishes of the Quebec government and the National Assembly, which have called for Revenu Québec to collect all income taxes in the province. Currently, taxpayers and employers in Quebec have to fill out separate forms with the Canada Revenue Agency and Revenu Québec every year. The debate over the creation of a single tax form is shaping up as a key electoral debate in the province, as the Conservative Party and the Bloc Québécois are the only parties defending the proposal at the federal level. “The Prime Minister has slapped Quebeckers in the face by closing the door on this proposal to simplify their lives by having to fill out a single tax form,” Conservative MP Alain Rayes said. Mr. Trudeau initially slammed the proposal by saying it would put 5,500 federal jobs in Quebec at risk. He then argued the Conservatives were keeping the rest of Canada in the dark by not asking about the issue in English. “I will always stand up to defend the interests of Quebeckers and indeed all Canadians, but I will also stand up for what’s good for Canadians and stand against pandering to the provinces,” Mr. Trudeau said. Mr. Trudeau has said that he could agree to a single tax form in Quebec as long as it was administered by the Canada Revenue Agency, which already does the job for the rest of the country. The biggest challenges facing harmonization is the fact that Canada and Quebec have different ways of calculating income and determining how much individuals and companies make and need to pay back in taxes in a given year. According to a comparison developed by the Quebec government, there are more than 100 differences between the federal and provincial regimes, including exactly which work clothes are a taxable benefit; how waiters, sailors and artists need to calculate their income; whether daycare costs are tax deductible; and whether expenses such opera and jazz concerts qualify as business expenses. Diane Lebouthillier, the minister in charge of the Canada Revenue Agency, said that creating a single tax form would require the federal government and other provinces to adopt a common definition of income with Quebec. Otherwise, she said, Ottawa could not properly calculate financial transfers in Quebec under programs such as the Canada Child Benefit and the Guaranteed Income Supplement. “When it comes to defining income, the nine provinces and three territories have harmonized their definition, while Quebec has its own definition. Will we ask the provinces and territories to adopt Quebec’s definition?” she said in an interview. In addition, the federal Liberals are arguing that the move toward a single income-tax form would hamper Ottawa’s ability to conduct investigations into international cases of tax evasion. The Conservatives are pushing hard on the issue, having called for a debate on the issue in the House on Tuesday. Mr. Rayes rejected the Liberal Party’s accusations that harmonization would lead to job losses at Canada Revenue Agency offices in Shawinigan and Jonquière. Mr. Rayes said that the agency’s employees in Quebec could be given other duties, including fighting tax evasion, or reassigned to positions in other federal or provincial departments. In Quebec City, Quebec Premier François Legault predicted that Mr. Trudeau would “pay a political price” in the province for rejecting the proposal. He added he would refuse any attempt to have the Canada Revenue Agency collect income taxes in Quebec.